An extremely dense slate, mid-grey in colour with a beautiful rounded grainy texture. This slate is also used fpr roofing which is a testament to its durability and low water absorption rates. Azul Grey is a similar colour to Brazilian grey slate that we once imported but this slate doesn't scratch as easily and is not as brittle. The grain on the slate is similar to Chinese Black which is also roofing slate quality. Chinese Black and Azul Grey are both beautiful slate options. Both are strong, durable slates with excellent abrasion resistance with lovely, fine grain characteristics capable of delivering an elegant outcome. The image below shows Azul Grey slate on the floor of Pukara Estate's elegant showroom and office in Alexandria, Sydney. 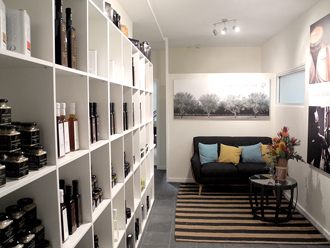 The company grows olives in the Hunter Valley and markets olive oil Australia wide and internationally. The floor attracts lots of admiring comments from customers.